ROV deployed wire rope cutter with integrated intensifier. Cuts up to 3” steel wire rope. The RCV75HD is a heavy duty wire rope cutter designed for subsea deployment in severe working conditions. 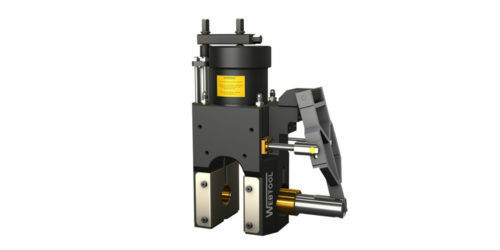 Its light weight and reliability make it a standard piece of tooling in many ROV fleets. Lightweight aluminium and stainless steel construction. Hydraulically operated anvil makes the tool easy to operate and removes the need for diver intervention. Robust and durable. Genuine Webtool™ blades and anvils give optimum cutting performance and ensure that maintenance is kept to a minimum. Integrated interlock – The blade cannot activate until the anvil is fully closed, preventing accidental operation in low visibility environments. Integrated minibooster intensifier – The RCV75HD requires a low pressure hydraulic supply to operate. Integrated relief valve improves reliability and prevents accidental over-pressurisation of the cylinder. Serviceability and Support – Spare parts including blades, anvils and seals kits are available. Contact us for technical questions and support. – Capable of cutting EIPS (1960 N/mm²) wire rope up to 76.2mm (3″) diameter. See “Cutters VS Grade” document for more details. – Hydraulic Supply – 210 bar input pressure. Flow rate 4 l/min to 14 l/min. – Compatible with ISO32 hydraulic oil, for details of compatibility with other fluids please contact us. – 7/16” JIC male adaptors (stainless steel) fitted as standard.